NORDO News - Aviation Unedited: Are You Kidding Me? 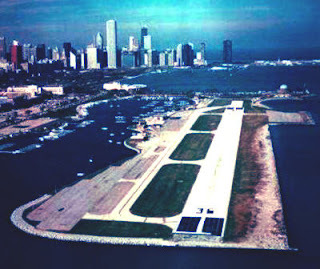 Remember this airport that inspired kids along Chicago's waterfront? Politics in aviation is something we must all learn to deal with. You may not like it, but it rules our lives. Therefore, we can choose to know it so that we may in turn defeat it, or we can ignore it and get run over. Or, in this case, we could be insulted with no recourse. I have not been a fan of NASA for many years now. I would love to be but I am not. Inside the walls of these letters lie a plethora of intelligent people stifled with bureaucracy. Brilliant people, who once sought to advance aerospace, in the greatest aerospace organization on the planet now find themselves working for a dwindling government agency driven, not by scientists or engineers, but by the whims of politicians de jour. This is why I do not like NASA. They are stifling our talent and our dollars. But now, NASA has come up with a way to recoup some of our misspent dollars and in the process a way to win back my heart. How? That’s easy. They can tell Chicago to go the #$@@. What? You haven’t heard? NASA is offering the retiring Space Shuttles up for “sale” and one of the organizations in the bidding is Chicago’s Adler Planetarium. So what’s the big deal? The Adler Planetarium sits on the same peninsula where the famed Meigs Field once sat before it was deviously cut up in the darkness of night by the City of Chicago. And now, the city’s planetarium has the audacity to say they want to orbiter so that they could use it "to inspire the next generation of explorers" and "serve as inspiration for math and science education." This is total bunk. That's Adler at top right. Let’s just call it how it is. These orbiters are seen by these people at trophies, not teaching tools, and the actual exchange of money is merely a way of making it look legitimate. But already it has been said the final decision, as to who gets them, will come down to NASA Administrator Charles Bolden Jr. He has asked that those in the running for the orbiters describe the "benefit to the nation" that would come from their receiving a shuttle. This includes how they would use it to "inspire the American public" and "increase the public's ability to understand the nation's space exploration agenda." I find it very insightful that NASA chose to use the word “agenda” instead of “mission” when it comes to this so called bid. On NASA’s website, it clearly says it conducts its work in four principal organizations, called mission directorates: Among these four missions is one critical to the Space Shuttle’s success, “Aeronautics”. This mission “pioneers and proves new flight technologies that improve our ability to explore and which have practical applications on Earth.” This mission is also clearly at odds with Chicago and the location upon which the orbiter would sit. Awarding an orbiter therefore, to the planetarium, would be an insult to the combined intelligence of the aviation community, without which the shuttles would never have completed a single successful flight. Knowing this, you might think there is no way Chicago would win one of the orbiter bids. But let’s look at some recent history. During the past decade, many airline mergers were proposed and road blocked or shot down all together by the federal government and politicians, Democrats and Republicans alike. These included United and USAir (twice), American and Northwest, and Delta and Continental. Through the years, airline mergers have faced a long tough process of federal government approval. And, as a result, many airlines folded, others continued operating in the red, and the rest somehow managed to attract enough passengers with the allure of terrible service to stay afloat. Then, in 2010, United and Continental announced their proposed merger. When this proposed merger hit the news, it was reported in such a manner that sounded and felt as though it was already approved. Three months later, in record time, it was just that; approved. In the merger, the strong airline, Continental, agreed to move its headquarters to Chicago and take the name of the airline on life support; United. Now why would they do such a thing? Political posturing is why. Chicago jobs were saved, jobs were added when headquarters were moved to Chicago, the name of the Chicago based airline was taken, and ultimately they received, what was considered by many, guaranteed federal approval from a federal government led by a President from Chicago. 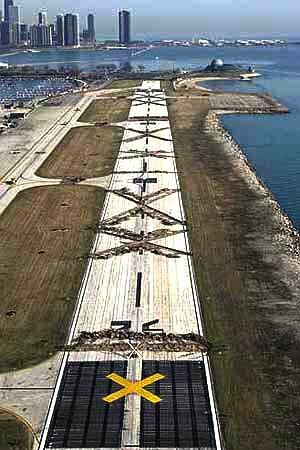 Now move forward to today when Chicago’s very own Adler Planetarium decides it wants a Space Shuttle. The new mayor is the President’s previous right hand man, and the person who will make the final decision, as to who will get the orbiters, is the NASA Administrator who in an interview said he has three goals as administrator; re-inspire children to want to get into science and math, to expand NASA's international relationships, and to reach out to and engage the Muslim world. Neither of these is on NASA’s list of mission directorates. So clearly, he is driven by politics. Having looked at this situation thoroughly, there is but one question left; who will get the other one? But let’s not give up. If you would like to contact NASA and “encourage” them to award the orbiters to someone other than Chicago, here is their contact information. You do not have a lot of time as they plan to announce the winners on April 12th and the administrator’s decision will be made days before then. Before writing this, I contacted the Adler Planetarium to find out what their President’s position was on the closing of Meigs Field. Since he was there during the battle for Meigs Field, I felt it was important to this debate. Traffic departing or landing at Meigs passed directly over the heads of people visiting the planetarium. The sight of flying machines actually seeming to defy gravity must surely have been an inspiration to the many kids visiting Adler and I therefore find it hard to believe he would have been for closing it. But I guess I will never know. Neither he nor the planetarium responded. Note: To my knowledge, I was the last person to base a commercial operation at Meigs, not counting the contractor that sold fuel. Having seen the blatant corruption that exists in Chicago first-hand, I feel qualified to make these remarks. I also know, in my heart that Chicago does not deserve either of these orbiters. And, in the Chicago way, you take one of mine, I take some of yours. So please, voice your objection to the Adler Planetarium’s quest for another Chicago trophy. There are many other places, like Texas, that would be a far better fit for the orbiters. In these places they would be on display in appropriate environments and surrounded by people who really do want to inspire kids to reach for the stars. Chicago is not such a place. Statements like that take my breath away. Are there really people who are so smug, self-righteous, and all-knowing that they, and only they, know the best place for that shuttle? If you had gone to the Naval Academy, become a Marine Corps officer and aviator, were valorous in combat, became an astronaut, then a USMC General, and finally, after 30 years of faithful public service, became the head of NASA, like Charlie Bolden did, then you might just have some say in this matter. You didn't so you don't. Get over it. Glad to hear today that Chicago did NOT get one of the Shuttles! "The space shuttle Atlantis will be displayed at the Kennedy Space Center Visitor Complex in Florida; the Endeavour, at the California Science Center in Los Angeles; the Discovery, at the Smithsonian's National Air and Space Museum Steven F. Udvar-Hazy Center in Virginia; and the test shuttle, Enterprise, at the Intrepid Sea, Air & Space Museum in New York, NASA Administrator Charles F. Bolden Jr. said during a ceremony at the Kennedy Center. The announcement was made on the 30th anniversary of the space shuttle program's first flight and the 50th anniversary of Soviet Cosmonaut Yuri Gagarin becoming the first human in space."